MEDI+SIGN gains a place on the 2017 Top Twenty Minogue Award for Patient Safety Innovation at the Annual Maryland Patient Safety Conference held in Baltimore, Maryland. April 10, 2017, Smithsburg, Maryland — MEDI+SIGN recently attended the 13th Annual Maryland Patient Safety Conference and was recognized for their efforts in providing healthcare solutions that focus on patient safety while improving costs. MEDI+SIGN, along with 70 other applicants, completed a project which was submitted to the Maryland Patient Safety Center for consideration for their role in patient safety. The submitted projects underwent rigorous review and the list was trimmed down to only 20; the 2017 Top Twenty Minogue Award for Patient Safety Innovation. In addition, MEDI+SIGN demonstrated their patent-pending electronic patient-room solution at the conference and presented their project poster. The conference was held in Baltimore, Maryland on March 17, 2017 and brought together health system leadership, physicians, nurses, pharmacists, quality professionals, risk managers and patient safety officers. With a focus on pressing safety issues, the conference goals were to address issues that are fundamental to delivering quality care to patients in the safest possible manner. MEDI+SIGN is a connected platform with digital patient whiteboard solutions that are designed to improve satisfaction and coordination of care for patients in a hospital setting. MEDI+SIGN is dedicated to reducing costs and improving quality and delivery of healthcare solutions. Further details about MEDI+SIGN’s patient monitoring and digital whiteboard solutions are available on the company’s website: www.medisigndisplays.com. Questions or opportunities may be addressed through the website, or by phone (301-790-0103) and e-mail (sales@medisigndisplays.com). 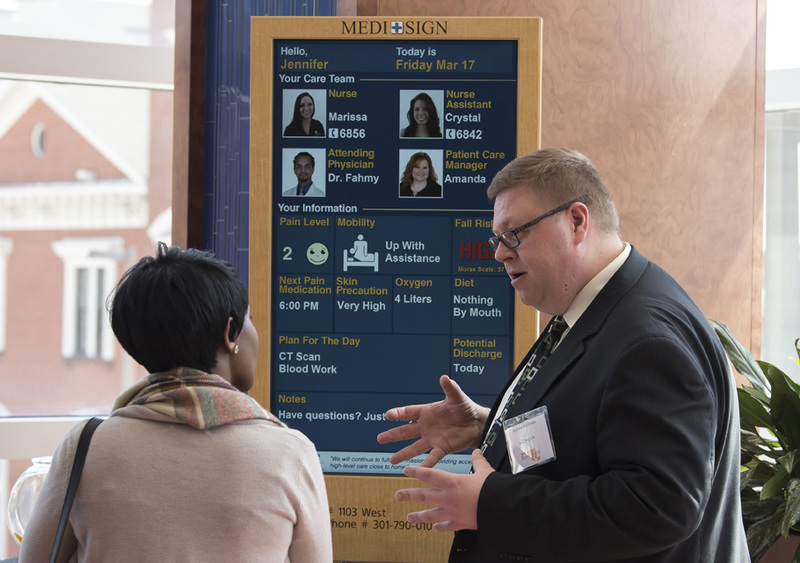 MEDI+SIGN provides hospital and healthcare organizations with a connected health platform that includes patient monitoring and digital whiteboard display solutions. MEDI+SIGN integrates with electronic health records and remote monitoring systems to collect and communicate updated and accurate patient health and status information to care teams and patients. MEDI+SIGN was established to leverage its proprietary visual communication technology to improve hospital and healthcare provider’s performance in patient safety and satisfaction, as well as the overall quality and delivery of healthcare. For more information, please contact us at www.medisigndisplays.com. Noventri and MEDI+SIGN are registered trademarks of Specialized Communications, Inc. Other company and product names may be trademarks of their respective owners.